"The Dominion is here, and we're watching you." Ondolemar is a Thalmor Justiciar living in Understone Keep in Markarth. Along with two Thalmor Soldiers, Ondolemar is stationed in the City of Stone to observe and prevent any kind of Talos worship, in accordance to the White-Gold Concordat. Ondolemar will ask for your assistance to gather evidence from the house of the local bard, a favor he may return during the quest Diplomatic Immunity. Always protected by his two soldiers, Ondolemar spends the entire day patrolling up and down the area in front of the throne room, from the kitchen to the smithy. At midnight he heads up to the northwestern strategy room where he spends six hours eating a nightly meal. If the Stormcloaks take over Markarth, there will be no room for a Thalmor in the court and Ondolemar will die. His remains will be buried in the Hall of the Dead. 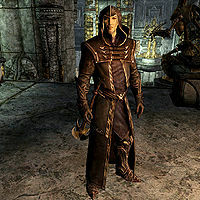 Ondolemar wears Hooded Thalmor Robes with Thalmor gloves and boots. He knows a variety of spells, specifically Oakflesh, Firebolt, Flames, Ice Spike, Lightning Bolt, Lightning Cloak, Sparks, Healing, Lesser Ward, and Steadfast Ward. Like many Thalmor agents, Ondolemar acts on his beliefs of racial supremacy and can be highly condescending. 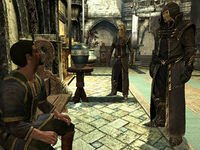 When speaking to you, he will say: "You have the honor of addressing a member of the Thalmor. Bask in it. ", "The Dominion is here, and we're watching you. ", "The Thalmor know how to deal with Talos worshippers. ", "If you see any signs of Talos worship, it's your obligation to report them to me. ", "The Aldmeri Dominion is the only thing keeping the Empire on its feet." and "This war is such nonsense. All this fuss over their false human god." When asked to explain who the Thalmor are, he will readily say: "We're the ruling body of the Aldmeri Dominion. Saviors of Mer. Victors of the Great War. The Empire exists because we allow it to exist, and I'm here to make sure the Jarl of Markarth remembers that." He will then elaborate on the expression 'saviors of Mer': "The Thalmor saved all of Elven-kind during the Oblivion Crisis. We've been watching over our lands for 200 years. We re-founded the Aldmeri Dominion, an alliance between us and our Bosmer cousins. You might know them from their common name. Wood elves. We intend to prove the superiority of Mer over Man, one century at a time." If you ask him if he is from Markarth, he will reply: "As if this craggy, wretch of a city could give birth to a superiorly bred Mer such as myself. No, I'm not from Markarth. I was sent here to lead the Thalmor's interests in this corner of Skyrim. It's my mission to root out all Talos worship in this city." He will then explain why the Thalmor hate Talos worshippers: "It's a religious matter. The Thalmor do not recognize Talos as a god. He was only a man, and does not deserve to a place in our pantheon. The Empire has agreed to accept our beliefs, and its citizens have a responsibility to cease their heretical worship. You're awfully inquisitive, aren't you? I like that. Perhaps you'd care to solve a little problem I'm having?" With this, Ondolemar is ready to ask you a favor about a certain Markarth citizen: "Ogmund the skald. He's old, respected, and I know for a fact that he worships Talos in his home. But the Jarl has been hesitant to call for his arrest. I want you to break in to his home and find evidence." With these words, the quest will initiate and you will have to break into Ogmund's home and claim his Amulet of Talos. When you return to Ondolemar, he will commend you on a job well done: "Ah, there we have it. This will be all I need to have Ogmund taken care of. I would like to personally thank you on behalf of myself and the Thalmor for your assistance. Here, for your work." He will then hand you some gold and his disposition will be raised, causing him to greet you in a more friendly tone and be willing to help you inside the Thalmor Embassy. 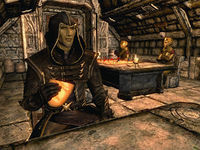 During the quest Diplomatic Immunity, the guest list of Thalmor Ambassador Elenwen consists of the higher-class residents of Skyrim. Ondolemar will be present and will have a whole bunch of new greetings ready: "The degeneracy of the Empire is on display here in this room. ", "It's only a matter of time before your whole rotten Empire collapses of its own decay. No offense. ", "None of these people cares a whit about the religious aspects of this war. Another sign of the degeneracy of your Empire. ", "At least Ulfric's men are willing to fight for their principles, barbaric as they may be." and "It's a necessary part of my job to mix with the upper classes of Skyrim, such as they are." You can then ask him if there will ever be peace between the Thalmor and the Empire: "There is peace now, and that peace will continue for as long as it suits our needs. But make no mistake, this is not a peace forged out of necessity between rival nations of equal strength. It is more like the calm between storms. And the next storm, I think, will be far deadlier than the last." When asked what he is doing in Skyrim he will reveal his position: "I lead the Justiciars. We are charged with enforcing the ban on Talos worship. Nords can be quite stubborn. They're slow to change their ways, and we find more heretics every day. But mark me well -- I will purge the heresy from this land as surely as the flame burns the flesh from the bone." Lastly, he will explain what he is doing at the party: "There are those in the Empire who would wish to evade their obligations to help root out the Talos heresy. Fortunately, those most opposed to the Emperor's wise policy have now branded themselves traitors as well as heretics. I am here to remind the ruling classes of Skyrim that their loyalty to the Emperor requires cooperation with the Thalmor." "How dare you speak of the Thalmor in such a disgusting manner!" Ondolemar: "How dare you speak of the Thalmor in such a disgusting manner!" Ondolemar: "Your insults and provocations have gone far enough! I'd kill you where you stand if I wasn't bound by my oath as an officer of the Aldmeri Dominion." or: "This is preposterous. Disrespect... insulting! I am tired of being hounded from all sides!" or: "Madame Ambassador, you know that I would never have behaved... that is to say... well I swear I'm innocent this time!" Ondolemar: "Forgive me, Ambassador. I allowed this... fool to provoke me. The fault is mine. There is no need for further disruption on my account." or: "That is absolutely untrue! Uh, that is, yes, of course. What... I don't understand why everyone... never mind." Once the quest is completed, Ondolemar returns to Understone Keep, with his eyes and ears on everything related to Talos. Ondolemar was originally meant to be killed by Galmar during the Stormcloaks' siege of Markarth, but the quest and scene did not make the final cut of the game. If you complete Search and Seizure by stealing Ogmund's amulet, and then Ondolemar dies, the amulet will be on his body. However, if you loot it from him, it will still be marked as stolen. If you have Ondolemar provide a distraction during Diplomatic Immunity, he will no longer use friendly speech towards you and instead speak to you as if you had not completed Search and Seizure. Ondolemar's mouth is unique to him and unavailable for character creation without mods. Resurrecting Ondolemar as a Dead Thrall will cause his two Thalmor soldiers to follow him, thus following you. Attacking anyone who is not hostile, however, will turn the Thalmor soldiers against you, though Ondolemar will still fight as one of your followers. If you are detected killing either of the Thalmor soldiers, your Reach bounty will increase. The Thalmor Soldiers following Ondolemar will continue to respawn if Ondolemar dies or the Stormcloaks take Markarth. This page was last modified on 8 January 2018, at 22:15.